Let’s hear it for the boys! 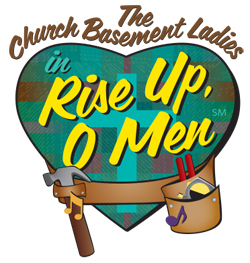 Fans of the musical comedy series Church Basement Ladies will finally get to know more about the men of East Cornucopia Lutheran Church, in the new production Rise Up O Men at the Van Singel Fine Arts Center for one performance only Tuesday, March 26 at 7:30 pm. The series of Church Basement Ladies productions are inspired by the bestselling book Growing Up Lutheran by Janet Letnes Martin and Suzann Nelson. This latest chapter in the lives of these rural Minnesota Norwegians was developed by Greta Grosch, who wrote the scripts for the second, third, fourth, and fifth musicals in the series. Reserved seating is $35 for adults and $22 for students (high school and younger). Reserve seats by calling the Van Singel box office at (616) 878-6800 or purchase on-line at www.vsfac.com. The box office is open Monday through Friday, 12 noon to 5.